According to the newsfolks, it’s time to baton the hatches, put on the galoshes and head inside for the first storm of the season. And after our dry few years, we’re ready for it. But I thought I’d take this time, while we are enjoying the indoors to reflect on the good things about this past growing season. 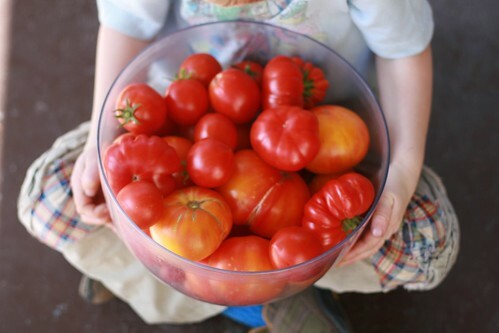 Sure we were full of disappointments this year, but our tomatoes…our tomatoes were a huge success. Oh sure, at first I complained about how they weren’t turning red, but once they did, they came on in full force. 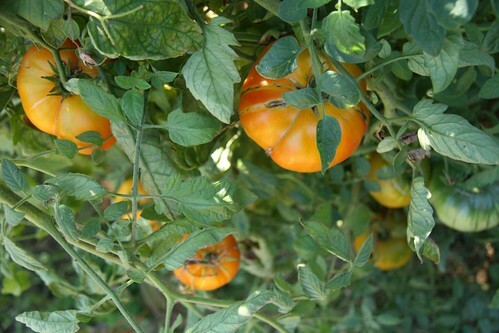 This year we limited ourselves to five plants, Better Boy, Consoluto Fiorentino, Italian Heirloom (generic name, isn’t it? ), Big Rainbow and a Sweet 100. 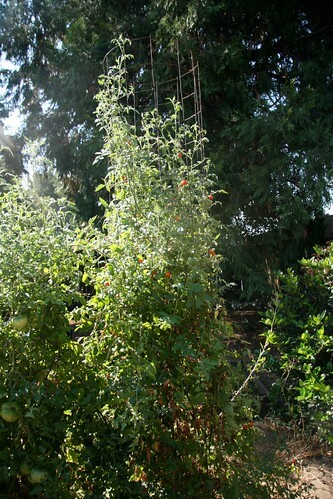 We also had a spare volunteer cherry tomato that has been sprawling along the ground with the melons too. All five plants that we planted were incredibly happy this year and all pulled their weight as heavy producers. Better Boy hit the ground running at the begining of the season and Big Rainbow has been pulling in the tail end of the season with baskets full of orange goodness. 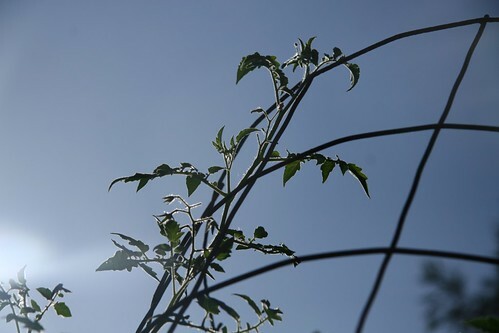 Our Sweet 100 even reached the top of the 10 foot cage…way to go little plant! We’ve made about 10 pints of canned sauce and have another handful of portions frozen in the freezer. Plus I dehydrated the Sweet 100’s this year and have about 2 cups of those in the pantry. We should be plenty supplied well into the winter with our own spaghetti sauce. So tell me, what was your biggest garden success this past summer?